It’s big. It’s bold. It’s larger than life, and it’s finally here! 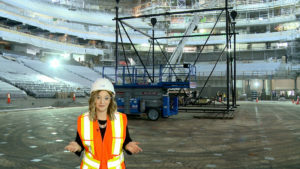 Jessica Kent reports on the installation in this week’s episode of ICE Level. At the centre of attention, engaging millions of fans, the Rogers Place scoreboard has quickly become a much anticipated benchmark in providing a world-class entertainment experience. Measuring at 46 feet wide, 46 feet deep, and 36 feet high, it will be the largest true high-definition scoreboard in the National Hockey League when the arena opens this September. Estimated to be four-and-a-half times larger than the scoreboard in Rexall Place, the Rogers Place scoreboard was transported to its new home in Edmonton beginning on Friday, May 6. “Once the structure is done, about a week later, the LED boards will start arriving in seven or eight trucks. They’re so large that even the main scoreboard will come in three separate pieces per side and the rings come in four or five pieces per ring, so there’s probably close to 20 gigantic chunks of LED screen that get bolted together and attached to the super structure,” explained Mason. Before the scoreboard arrived from its birthplace in Las Vegas, the team at Rogers Place conducted load testing to ensure the utmost safety. “We did a 100 per cent load test, which passed without issue, and then we loaded it to 120 per cent capacity just to take that extra safety measure,” said Rogers Place Project Coordinator (PCL), Ryan Chrapka. At 100 per cent, the hoist raised 90,000 pounds, adding an additional 25 per cent for the final test— for a total of 112,500 pounds. Last month, the Rogers Place team paid a visit to Nevada to check on construction progress. The scoreboard was then deconstructed for transportation, and is now carefully being reassembled at centre ice inside Rogers Place. “When it came to site here, it went together quicker than expected so far, and we’re hoping it continues the same way,” added Chrapka. You can be one of the first to catch a glimpse of this iconic scoreboard by attending the Rogers Place Open House on Saturday, September 10.